About Spokane's "The New Moon Art Gallery"
Fine Art & Craft at the New Moon! 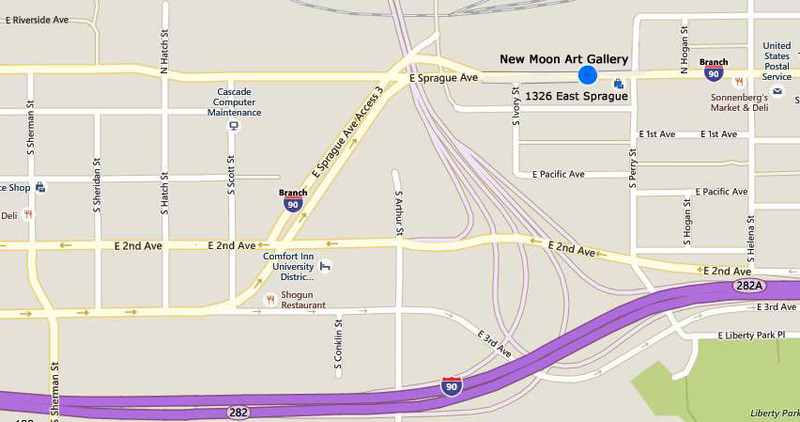 The New Moon Art Gallery was originally founded in 2012 as "Manic Moon and More". We are a Spokane, WA based art gallery and co-op, where we showcase local artists and artisans from the Inland Northwest that create whimsical & colorful work. When we changed our gallery's name we also changed our address to 1326 East Sprague Avenue, at the corner of Perry Street, just minutes from downtown Spokane. Visit our gallery shop, filled with affordable handmade items that are fantastic gifts! At the New Moon Art Gallery we host monthly Saturday artist receptions to kick off our latest shows, that last mid-month to mid-month. And if you are feeling creative, join us for an enjoyable art party or art workshop. To receive our quarterly newsletter, workshop updates and personal invitations to our private art events, you'll want to add your email address to our mailing list ~ to easily do that, click HERE. "This is a bodacious, delectable and sensational place to visit. It is like heaven for artists. Go and taste it and the many flavors will blast out of you with each piece of art you sample."